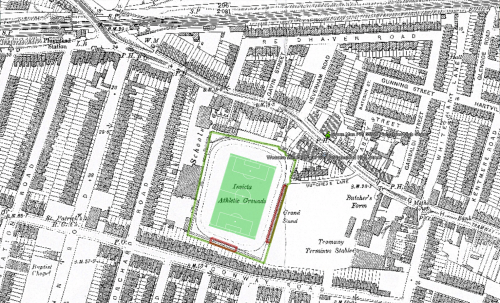 The first reference of the new ground came in March 1890 as local mineral water and pub magnate George Pike Weaver purchased over four acres of land on the south side of Plumstead High Street. In early April work was progressing as the site was transformed into a football ground and cycle track by fifty men who were hard at work with carts and horses, moving thousands of tons of earth. The initial design had a terrace, and a grandstand to shelter those willing to pay for the privilege. A cinder path, 15 feet wide, went all round the quarter of a mile circumference, and the inner space was grassed over for footballers. On 9 May 1890 the ground’s name was confirmed in the press. 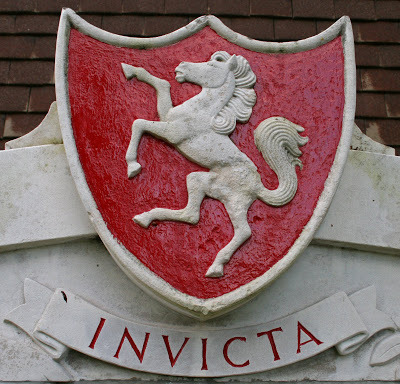 Invicta means ‘undefeated’ or ‘unconquered’, and Invicta has been Kent’s motto since the days of William the Conqueror. It is likely that the landlord, himself a ‘Man of Kent’, chose the name to protest at the area’s recent incorporation into London. Work moved apace, and in early June the ground proprietor reported that the turf was in the process of being laid. It was budgeted to cost in the region of £6,000, and for his outlay Weaver asked for the sum of £200 per annum rent. Royal Arsenal Football Club decided to accept the offer for three years. Weaver would not accept less than £200 per year, because he had overspent his original budget, encountering unexpected costs. He had to buy two nearby cottages due to light obstruction, and a third for the construction of an entrance for horse drawn carriages. All in all, it was a modern stadium for the club to move forward! The scene at the start of the first game against the 93rd Highlanders was, by all accounts, one of splendour. The grandstand was draped with red cloth, decorated with trophies of flags, and streamers were hung from the flagstaff. Long before the commencement of the game hundreds were to be seen wending their way towards the entrance. By kick-off every available place from which a good view of the game could be obtained was packed. The turnstiles groaned and while the grandstand was not finished, the terracing was and it was packed to the rafters. Ground admission at the start of the Invicta period was: Men 3d, Boys 2d, Ladies free. Additional fees of 6d for the grandstand and 3d for the terraces were applied. The standing areas in the ground were prone to becoming bogged down in wet weather and this was partly ameliorated by the terracing, though it was more expensive to stand there. 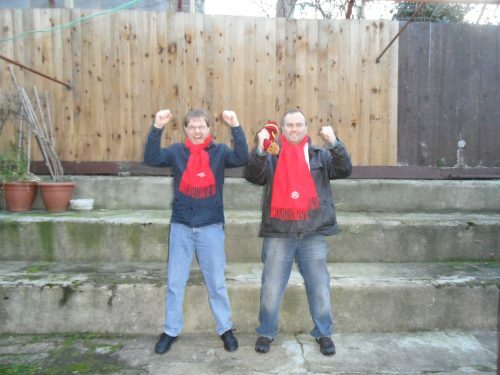 The club did need on occasion to remind the fans that the terrace steps were for standing and not sitting on! After the club turned professional, the admission prices increased marginally, but ladies were still able to access the games for free. Royal Arsenal played their last game at the Invicta on 29 April 1893 against Stoke, and, after the game, took van loads of items to the Lord Derby pub and Manor Field. The club left Invicta as Weaver had attempted to take over the Arsenal. A rival team – Royal Ordnance Factory FC – took over the tenancy of the Invicta for one season, but from then on the ground lay idle. Weaver applied for a housing project by the London County Council, which went ahead in June 1897, despite his premature death in 1896. The LCC project constructed the house and road layout which were pretty much as they are to this day. 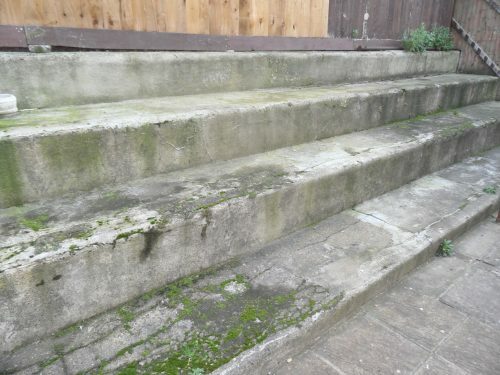 TheArsenalHistory.com have twice visited part of the Invicta Ground and the concrete terracing is in remarkably good condition seeing as it was installed over 125 years ago. We celebrate a monument to Victorian builders and the Arsenal.